The Privileges Committee of Parliament has recommended the suspension of the Assin Central Member of Parliament, Kennedy Agyapong after he was found guilty of contempt of Parliament. 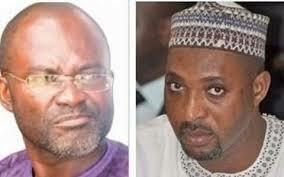 The committee in its recommendation and conclusion into an investigation into his [Agyapong’s] description of parliament as a ‘’useless’’ and ‘’cheap’’ said, the committee found the legislator guilty. ‘’The Committee has carefully considered the matter in the light of totality of the evidence gathered and in accordance with the provisions of the constitution, the Standing Orders and other relevant enactments and concluded that the Hon. Member for Assin Central Constituency, Mr Ken Ohene Agyapong is indeed in contempt of parliament for remarks he made that ‘’Parliament is cheap’’ and ‘’Parliament is useless’’. Minority Chip Whip, Muntaka Mubarak in June last year, dragged the Assin Central MP before the committee after he described parliament as ”useless” and ”cheap”. The Committee’s Chair, Joseph Osei Owusu, on Tuesday appealed to Speaker Mike Oquaye, to allow them complete the second issue brought before it against the MP so they will combine the two reports. But the Speaker rejected his appeal and asked the committee to present the contempt report before the house today [Wednesday],.